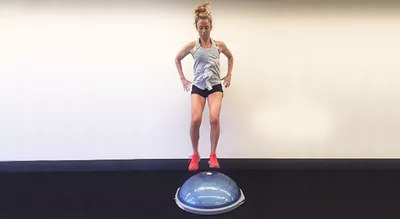 A BOSU ball, aka that half-ball on a rigid platform that's normally near the other stability balls, can be used in a variety ofÂ ways, and it can really help to take your standard moves to another level. The great thing about a BOSU ball is the versatility. You can not only use this with the rigid back on the ground, but you can also flip it over and balance on the ball-side. Ready to get to work? Here are 6 BOSU ball moves to tone your whole body. You'll perform 30 to 60 seconds of each exercise, resting 1 minute in between. Perform this circuit 2 to 4 times depending on your fitness level. Place the BOSU ball with the rigid back down and the ball-side up. Stand to the left of the BOSE and place your right foot on the ball. Push through your right leg and then switch your feet mid-air so that your left leg is placed on the ball as your right leg lands to the right of the ball. Repeat this on the other side and then continue this side-to-side movement until your timer runs out. Place the BOSU ball with the rigid back down and the ball-side up. Grab a set of dumbbellsÂ and stand with both feet on the ball-side of the BOSU ball. Stand tall with your chest out, shoulders back, and dumbbells at your sides. When you've got your balance, slowly squat down, keeping the dumbbells at your sides. Perform a dumbbell bicep curl as youÂ move back up to standing, and repeat for the allotted time. Place the BOSU ball with the rigid back down and the ball-side up. Stand with both feet on the ball-side and find your balance. Stand tall with your chest out, shoulders back, and feet shoulder-width apart. Begin jumping straight up and down (as if you were on a trampoline) being careful to land as softly as possible. Jump until the timer runs out. Pick up the BOSU ball with the handles, making sure the ball side is facing the ground. Stand with your feet shoulder-width apart, shoulders back, and chest out. Squat down, bringing the BOSU ball to the floor, andÂ jump your legs back into a plank position. Next,Â jump or step back up into low squat. While staying in your low squat, lift the BOSU over one shoulder then the other.Â Remember to keep all weight in your heels while sitting in your squat. Repeat until the timer runs out. Pick up the BOSU ball with the handles, making sure the ball side is facing the ground. Stand with your feet shoulder-width apart, shoulders back, and chest out. Squat down, bringing the BOSU ball to the floor, with the ball-side down. Jump back into a plank position, perform a push-up, and then jump or step your feet back to a low squat. From here, you'll stand straight up and bring the ball straight overhead. Repeat as many times as you can for 30 to 60 seconds. Place the BOSU ball with the rigid back down and the ball-side up. LayÂ back into the BOSU ball, making sure your lower back is supported. Place your hands behind your head loosely, and place your feet on the floor in front of you with your legs at a 45 degree angle. Engage your core and crunch up. Hold for 1-2 seconds and then release. Be sure to keep your chin towards the ceiling and your hands just lightly touchingÂ your head, so as to not pull on your neck. Repeat for 30-60 seconds.